(July 8, 2016) At the Steele Creek Residents Association Annual Meeting in February, Charlotte Douglas International Airport Staff displayed two maps showing flight paths for airplanes passing over Steele Creek. They now have provided copies of these maps. Click on either image below to view a PDF version of the map. The first map shows flight paths for airplanes landing in a northbound approach to the airport on February 23, 2016. Airplanes aproaching from the north must fly past the airport on either the east or west and turn to approach the runways from the south. This map does not show paths of airplanes taking off towards the north. The second map shows flight paths for airplanes departing in a southbound direction from the airport on February 24, 2016. Airplanes with destinations towards the north must turn soon after takeoff. 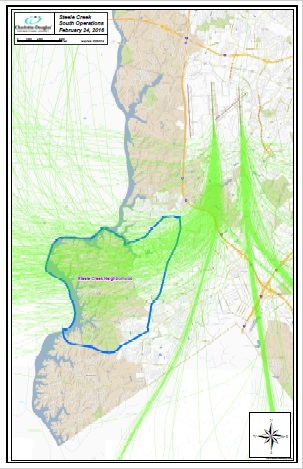 Flight paths to the southwest reflect implementation of Phase 1 of the Charlotte airspace modernization on October 15, 2015. 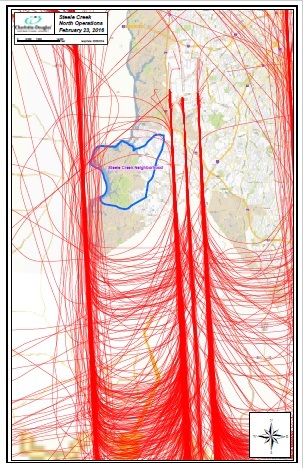 The result is more dispersion of airplane takeoff routes and thus more dispersion of noise. The maps show erroneous boundaries of Steele Creek that Google Maps unfortunately continues to display. The FAA is holding a meeting on the next phase of the Charlotte airspace modernization from 6:00 to 8:00 PM on Wednesday, July 13th at Bette Rae Thomas Recreation Center. See FAA ANNOUNCEMENT for details.